Some album art from songs featured on The Micro-Chop Daily X #45. We’ve made 170 Micro-Chop Daily X 10-beat Spotify playlists, with a few missed days here and there. Here’s how you can access all of them. To skip the explanation below and head straight to music, you can go directly to my Spotify playlists — including all of the Daily X playlists — through my account or browse The Micro-Chop Daily X archives on Twitter. My frustration with the general lack of money and professionalism in music journalism reached a boiling point during the late summer and fall of 2018. I remember coming home from my part-time teaching job one day and telling my wife that I was done with Micro-Chop and everything else — returning to full-time teaching was the only path forward that made any sense. The Micro-Chop Daily X #1 — where it all started. I have since walked back a bit from that conclusion, but I still have my days where it’s hard to see a stable path forward in the incredibly unstable and hypercompetitive world that I’m trying to navigate as best I can. Out of a bit of desperation and a desire to boost Micro-Chop’s social media visibility and overall following, I started making daily 10-beat instrumental playlists and sharing them on the Micro-Chop Twitter feed. 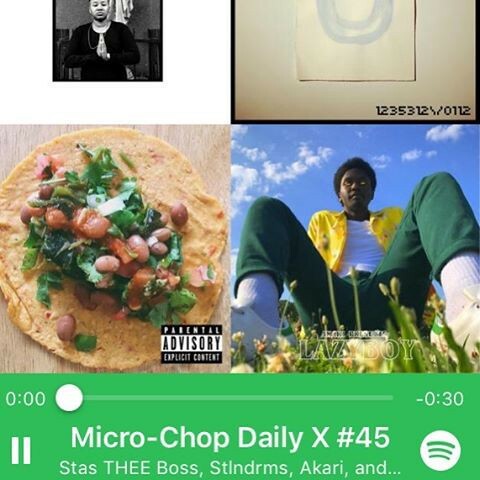 I named them The Micro-Chop Daily X.
I also wrote an article to correspond with each daily playlist — though I quickly realized people cared more about the music than the daily writing, so I decided to focus on daily playlists and less frequent Micro-Chop long-form pieces. It’s been a fun experiment, and I’ve even had guest curators like Dibia$e, eu-IV, Kilamanzego, John Morrison, and ProducerTrentTaylor. I’ve also had a chance to focus on specific labels, crews, regions etc. The Micro-Chop Daily X #53 — one of my personal favorites. After sharing a playlist (almost) every day for the past 170 days, Micro-Chop’s Twitter following has grown from about 1700 to 3900. I can’t say for sure how many of those followers have found the site or Twitter feed from a daily playlist, but releasing something with such great frequency has definitely helped me connect with many new artists, listeners, and journalists. As the number of playlists continues to grow at an alarming rate, I’ve struggled with how to archive them in a way that doesn’t feel cumbersome to navigate. I thought about making a massive Medium post listing every playlist and hyperlinking them or a giant Twitter thread, but both of those options felt like they’d be too time-consuming to create and not very user-friendly. So I’m trying a couple of other options instead. Option 1: Follow/check out my Spotify account. You can browse through several hundred of my playlists and all of the Micro-Chop Daily X archives there. Option 2: If you’re looking for a more detailed description of the artists featured on each playlist, you can flip through all of the past Twitter postings of the Daily X playlist. Whichever option you choose, I hope this helps in exploring all of the playlists from the past and leads to some more musical discovery for our readers. Please feel free to leave feedback on the playlist experiment if you have any.